Beginning Elevation: 10,600 ft. Ending Elevation: 8,669 ft.
Access from Vail: Travel east from Vail on I-70 to Exit 190 for Vail Pass. Exit here and turn right, heading west, onto the Shrine Pass dirt road (FSR 712). Wearyman Road - FSR 747. 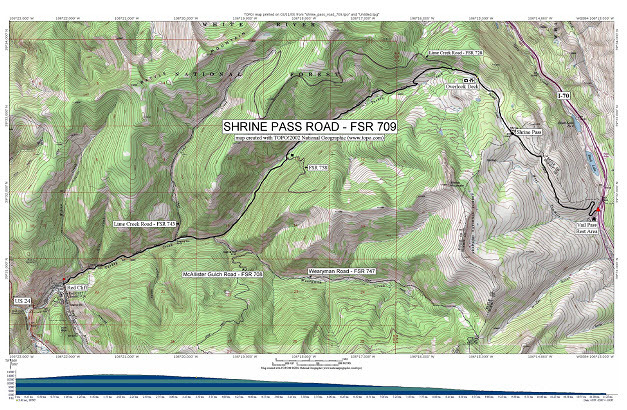 A brown information board on the right at 9.3 miles marks start of Lime Creek Road - FSR 743. And you will reach the town of Red Cliff at 11.2 miles. Take a right to get to Hwy. 24.